The first time I went to England, in 1967, there were still many reminders of the great Victorian Era. I remember the rag and bone man coming round and the milkman who still used a horse-drawn float. But because I was staying in a flat, I was not to know the joy and comfort of that great Victorian institution, the Full English Breakfast. I did not discover that until 1985 when, en-route to Enschede in Holland, I stopped for a week in London to do some research. The hotel in which I stayed was a converted multi-storied private home. My room was on the sixth floor and just under the roof. Small and cramped though it was, it was comfortable and homey and I struggled up and down the narrow flights of stairs several times a day. Breakfast was served from 7:00 in the morning, and I was usually down in the basement dining room early. There are many different interpretations and opinions about what constitutes this gift to the civilized early diner. For me, it will always consist of one or two eggs cooked so the yolk remained runny, bacon (less well done than Americans like it – not crisp), sausage (I later discovered Wall’s sausages – pink, bland and absolutely unbeatable when dipped into the yolk of your egg before popping it into your mouth), cooked tomato, baked beans, mushrooms and fried bread. According to Jamie Oliver, “Some things are too good to mess about with,” and he is right!1This is one of the great English culinary triumphs, ranked right up there with Fish and Chips. The Society goes on to argue that the notion of the English Breakfast as we know it today was developed by the “gentry” and was later taken up by the emergent middle-class. Mrs Beeton, in her Book of Household Management (1861), despite noting that it was unnecessary to provide her readers with "a long bill of fare of cold joints, &c., which may be placed on the side-board, and do duty at the breakfast-table," goes on to suggest garnished cold meat and "collared and potted meats or fish, cold game or poultry, veal-and-ham pies, game-and-Rump-steak pies" as food appropriate to the breakfast table as well as "cold ham, tongue, &c. &c."
She then turns her attention to hot dishes "for the comfortable meal called breakfast." Broiled fish, such as mackerel, whiting, herrings, dried haddocks, &c.; mutton chops and rump-steaks, broiled sheep’s kidneys, kidneys à la maître d’hôtel, sausages, plain rashers of bacon, bacon and poached eggs, ham and poached eggs, omelets, plain boiled eggs, oeufs-au-plat, poached eggs on toast, muffins, toast, marmalade, butter, &c. &c.
In her list one can find at least some of the elements that make up the Full English Breakfast, but clearly there is a much greater variety and a number of elements are still missing. 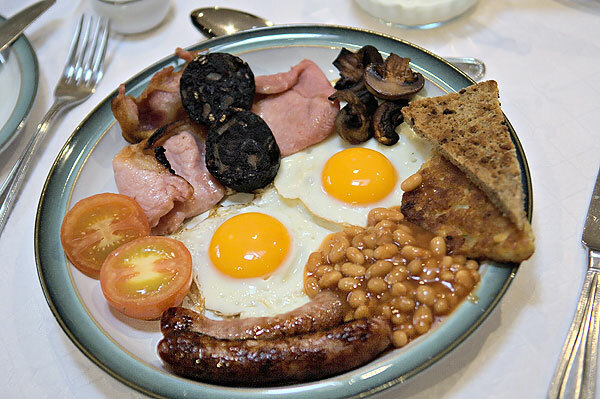 Perhaps what distinguishes the British breakfast is that it has traditionally offered hot dishes. Its centrepiece has been and remains, bacon and eggs. George Sala, in Twice Round the Clock (1859)3 talks of fried and poached eggs, bread and butter and bacon. But in addition he mentions smoked haddock and bloaters as items that "grace our morning repast." Preserved tongue, and anchovy paste, both from Crosse and Blackwell are included in Sala's list of breakfast foods. It can be argued that in this passage, Sala is describing the breakfast of the better working and middle class. Mrs Beeton is, of course, writing for the middle-class. The kind of breakfast she suggests (or at least the comestibles she lists) are appropriate to both that class and its betters. What then of the lower and labouring classes? What did their breakfasts consist of? Sala describes the breakfast available to the workers in Covent Garden, a breakfast that would have been replicated at any of the great markets in London. Clearly, bacon, eggs and bread were mainstays of the breakfast that many consumed in England. But the variety was far greater and it seems unlikely that there was anything in the nineteenth century that truly resembled the Full English Breakfast as we now know it. 3To read or download George Sala, Twice Round the Clock, click here.